It's been a long time since I've done a Menu Plan Monday. I either have been lazy and not planning meals or else I'll write it down on a piece of paper. Well, inevitably the paper gets lost and then I forget my plan and then we end up eating weird stuff for dinner. I LIKE planning my meals online because it keeps me organized. The last few months I have not been organized. I really want to get that back. It makes my life happier when I am organized. I've also been on a quest to use up the food that we have in the house. A lot of it at least. I'm a stockpiler. I buy on sale and keep it around for when I need it. Well, when the freezers and cupboards are full; it's time to use it up. Plus, money has been tight so I figure we'll USE all this food that I spent money on. Makes sense, huh. I started this quest a couple weeks ago and things are getting down. I still have a couple boxes of No Name Steaks in the freezer and a chuck roast. So this week I put both on the menu. I still have a couple of pounds bacon that I bought at Costco last month so that will go great with our breakfast-for-dinner meal. I have ground turkey that I will use for the spaghetti meat sauce. I'll actually make a double batch of sauce and freeze some for next week. I found a box of fish fillets that 4 out of the 6 of us will eat. Plus I have a big bag of waffle chips that has been sitting in the freezer for a long time. My secret recipe post is a vegetarian meal, that's all I'm saying about that. I can't wait for that one!! 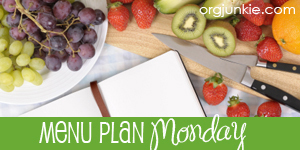 More menu planning ideas at I'm an Organizing Junkie.